One day after Italy’s 0-0 draw against Bulgaria, Azzurri coach Marcello Lippi is satisfied with his boys. Not so much perhaps with the lack of three points obtained Saturday (even though, he says, “the match against Bulgaria was an exam that we passed, despite not creating many scoring chances“), but rather because the current Italy squad reminds him of another glorious one… circa 2006. 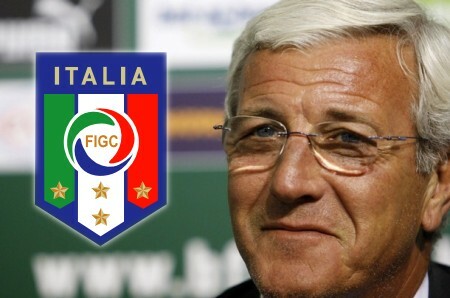 “For this stage in qualifying, we are at a more advanced level than the team I had before the last World Cup”, said Lippi. “This team has the right team spirit that took us to the World Champions title, and the magical chemistry that is necessary to achieve great things. I was very pleased to hear Daniele De Rossi say that it is easy for new faces to settle in to this squad, including the youngsters. De Rossi is a perfect example of this: he made the team at age 20, and then became a World Champion. This gives me great hope for the future“. During the afternoon training session, the Azzurri played a friendly match against Lecce’s youth squad. Alberto Aquilani appeared very much in form during the match, and will be a likely candidate for a starting role against Montenegro (probably replacing Montolivo). The match ended 3-0 for Italy, including a double by Daniele De Rossi. This entry was posted on Sunday, October 12th, 2008 at 7:13 pm	and is filed under Azzurri. You can follow any responses to this entry through the RSS 2.0 feed. Both comments and pings are currently closed.